This entry was posted on 27th November 2017 by admin. Does your garden lack space? Do you have an unattractive wall in your garden? Why not build a vertical garden using wall planters? 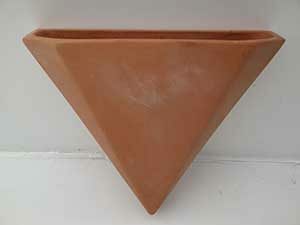 Terracotta wall planters can be used to grow herbs or other edibles or to provide a splash of colour by filling your wall planters with colourful flowers or trailing plants. Our wall planters are available in a range of sizes with flat backs so they can be easily mounted on a flat surface such as a wall or fence. Take a look at the wall planters we have in stock.